Casino Broceliande, simply known as Broceliande, is an online gaming and betting site owned and established by the Gantor International Ltd. in 2009. This site provides a wide array of game selections to its players, who are mostly French-speaking players. It is duly licensed and registered by the Lotteries and Gaming Authority based in Malta. Games featured on this site are managed and developed by the B3W software group. This is a renowned software developer worldwide, supplying unique and interactive games to the market. 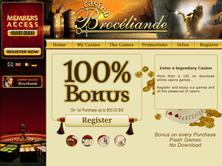 Broceliande's games are categorized into variants of table and card games, slot machine games, progressive slot games, video pokers, specialty games, arcade games, and many more. Some of its classic table and card games include game titles like Baccarat, Blackjack, Let It Ride, Casino War, Caribbean Stud, La Boule, and many others. 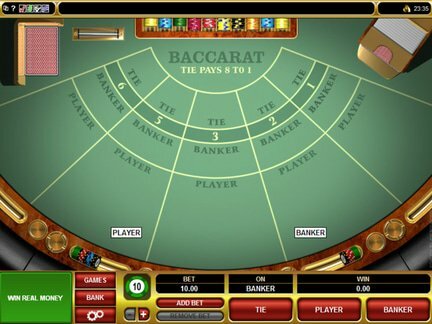 Several roulette games, craps, and classic poker games are also featured on this selection. The site also features a number of video poker games, as well as arcade and specialty games such as Lady Luck, Double Bingo, Keno, Wall Street, and Treasure Hunt. This site also offers progressive slots with huge amounts of cash prizes at stake. Other slot machine games, from the conventional three-reel slots to the virtual five-reel videos slots, are offered by this gaming site. All these games offered by the site boast its impressive graphics and quality, as well as its quick reload and easy-play features. The site's interface and sound qualities are also exceptional. Broceliande's gaming software further developed in terms of its animations, music quality, and special effects with the aid of its exclusive software developer, the B3W Group. In terms of the bonuses and promotions the site offer, it gives its new players the usual 100% welcome bonus which may amount up to $200 after their initial deposit. There are also free spins given to its players after every succeeding deposits made. Players may again receive a 100% deposit bonus on this free spin feature. Mystery bonuses and incentives are also given out to the site's players after every 15 minutes. This offer includes a bonus from $10 to a whopping $250 for its players with a 40x play through requirement. The only downside of this gaming site is its limited set of bonuses and promotions offered to its players. According to some casino review sites, it may somehow lessen the anticipation and excitement of its players. Bonuses and promotions are somehow considered as aiding factors of online gaming sites to entice its players. Nevertheless, this company provides a simple, yet enticing totality in term of the site's games and bonuses offered. These factors earn Broceliande a fair 3 out of 5 rating as an online gaming site.